Meet Maggie Counihan – a globe-trotting granny with an infectious zest for life. Maggie’s mantra is ageing with adventure. And she’s sure living up to it. It’s been 18 years since this pint-sized woman with a huge personality, shrugged on a backpack and ventured into the world to travel solo. She started her travelling sojourn at the age of 60, in India – a country she says she loves and hates at the same time. Then she hit the old hippy trail. “I always said I was older than most,” she laughs. She was on the road for the best part of a decade. She lived in Thailand and Cambodia, spent time in China and did the Trans-Siberian Rail from China to Russia. “I ran away from home at 60,” she says. But she wasn’t always so carefree. Maggie lost her mother when she was nine and lacked a female role-model. She was pregnant at 18 and married in a shotgun wedding with a baby in arms at 19. She had three daughters by the age of 23 and a marriage that was doomed. But Maggie’s not the type to wallow and she got out of the failing marriage and later re-married and had a son. She nursed her second husband through cancer and was widowed at the age of 50. And she claims she finally had her teen years in her 50s. Originally from New Zealand, she calls Australia’s Sunshine Coast home. But last month this dynamic woman celebrated her 78th birthday with Rollo, her partner of 10 years and a bunch of close friends in Siem Reap, Cambodia. That’s where she is living this year. Maggie has a love-affair with Cambodia that dates back more than 10 years. She’s been visiting nearly every year since then and sponsors two young boys in a children’s home, who she has watched grow and flourish over the years. This year she and Rollo are back in Siem Reap for a year or so and the couple, who play the ukulele (they are members of the Sunshine Coast Ukulele Masters – SCUM) spend their days visiting some of the region’s poorest schools and introducing music to them. Despite her tiny stature, Maggie is hard to miss. Her hair is a vibrant shade of red and she’s usually dressed in dynamic shades of pink, purple or orange. Her clothes are as colourful and vibrant as her personality. She’s chirpy and loves a chat – it’s hard to get a word in sometimes, but it’s never a boring conversation. And the nickname she and Rollo have given themselves – the Magpies – is apt. Maggie has written and self-published two books about her travels and adventurous life. The first, Backpacking to Freedom, Solo at 60 and the second a few years later, Bring on the Birthdays, Ageing with Adventure. Travelling has taught Maggie many lessons over the years. “I learnt about me,” she says. “I learnt how I tick and I’d never really thought about myself before. I learnt that I had confidence and to swear like a trooper when I need. She stayed at budget places because that’s where you meet people. And of course, it is much more affordable. When living in Phnom Penh years ago, she realised she would need a job to support herself and when she couldn’t find one, she created one – doing massage and reiki. It was on a return trip to Australia that she met Rollo. Friends had been asking her when she was going to settle down and she was excited about this trip home. She met up with Rollo a few months after arriving home – they had met briefly before but this time they clicked. “I fell in love,” she says. It was not long after that the couple moved to Vietnam to teach English. A new relationship developing in a new country. 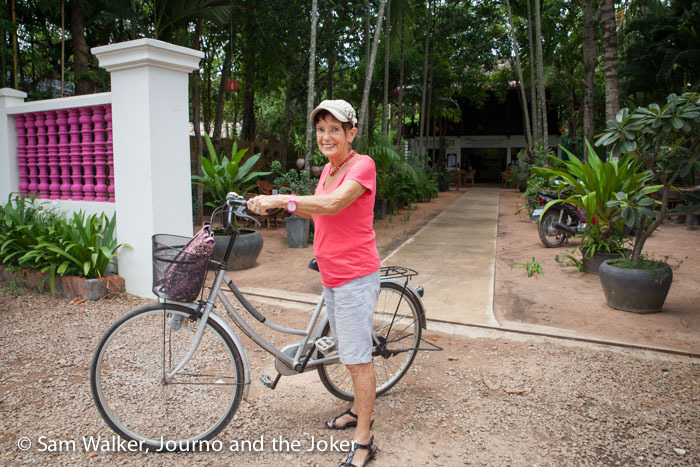 Maggie can often be seen flitting around the streets of Siem Reap on her bike. And together, she and Rollo head out to the various schools on the motorbike, laden with ukuleles and music and in all weather. Anyone who thinks age is a barrier to life, fun or adventure, should have a chat to Maggie. You’ll soon see there are no excuses. Life is for living and Maggie is embracing it whole-heartedly. Maggie is certainly an inspiration and a motivator. Have you met anyone who inspires you lately? Tell us about them. We love to be inspired. I LOVE this story! I’m sure you guys come across some amazing people in your travels, you should do more posts like this! Thanks Kira. Yes, we have met some incredible people. And I had grand intentions of posting a profile piece every week but they are quite time consuming to organise the interview, photos and then edit and write that I haven’t been as disciplined. I will try and change this though. lol that sounds like most bloggers I have met! Hi Mandi. Yes, she is amazing, although she really doesn’t think she is. How cute is she!! What a great lady to meet! I love the life she is living! Hi Liz. Thanks for stopping by. Maggie is very cute. She also knows how to have fun and enjoy life, which is so important. Hi Mariah. Thanks for stopping by and reading Maggie’s story. And thanks for sharing. I hope your friend enjoys Maggie’s story as well and it gives her inspiration to travel for many years to come. Hey StressedMum. Enjoy. It’s quite an inspiration. I love the “aging with adventure”- truly an inspiration to us all. Never say your too old to travel! Hi Elizabeth, thanks for stopping by. Glad you enjoyed the story. What wonderful inspiration. just shows that you’re never to old or too young to travel and learn. Great story. Hi Nina. Thanks for reading. Glad you were inspired. We really shouldn’t let age be a barrier to anything. WHAT an Inspiration! Love this story, she is AWESOME! Hi Lora! Yes, Maggie is fabulous. An example of how we should live life without putting restrictions on ourselves or making excuses for not doing the things we really want to do. Wow – what an incredible woman. I only hope I’m still travelling at her age – go Maggie! Yes, I hope I’m still out there travelling at that age as well. It’s awesome. What a fantastic story. My mum and dad are travelling at 78 and 77 and the planning and excitement keeps them young at heart and full of stories and vibrancy. And I know where my love of travel comes from – it’s in my DNA. Hi Leanne. Your parents sound like great adventurers and loving life. That’s what it’s all about. Yes me too, Fabiola. She is so full of fun and enthusiasm.